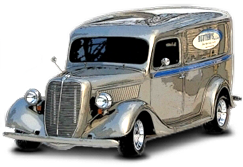 The CC1 is designed to fit 1927 and up automobiles with small block Chevrolet engines. This header will fit any rack and pinion set-up. 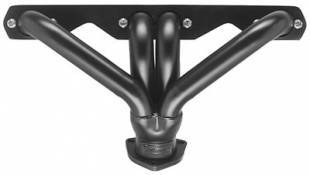 Also fits Vega steering and any Mustang-style mounted steering that is mounted with 2" clearance from the steering gear to the center ports on the driver's side. The header will clear any motor mounts, tie rods, or steering rods. Any starter and transmission combination will clear this header except cast iron Powerglides. Sanderson also offers a headpipe which simplifies installation in 1928-1934 cars. This is the most compact true performance header offered today. Comes with all hardware necessary for installation. This listing features PLAIN Blockhuggers.